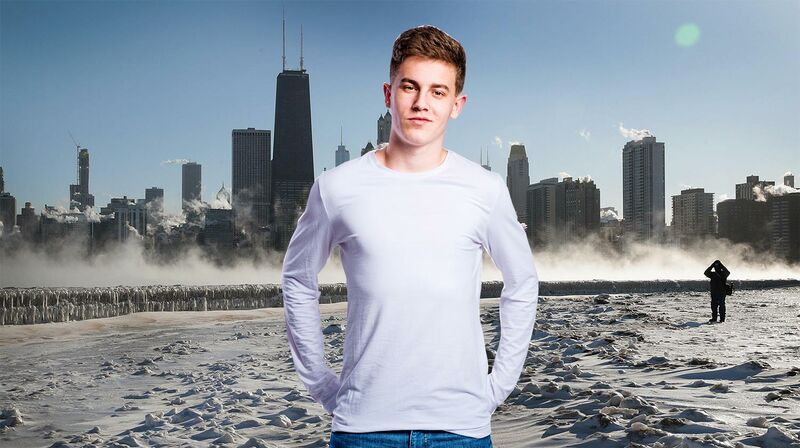 A 19-year-old Geordie lad, named Jon, has purchased a long-sleeved Tee for his trip to Chicago after learning of the extra-cold weather they’re experiencing at the moment. Chicago is currently in the wake of a ‘Polar Vortex‘, which has been brought on by freezing Arctic winds. Temperatures in Chicago have reached as low as -30C degrees which, according Geordie Jon, sounded ‘a bit chilly like’. Jon was forced to purchase his long-sleeved Tee outside Newcastle, as tee shirts with long sleeves are classed as ‘wussy thermals for poofs’. Jon arrived in Chicago this morning, before going for a stroll around the city in his long-sleeved tee. Locals were dressed in full winter gear, with coats, hats, scarves, gloves and protective eye-gear – while Joe was equally wrapped up in full length sleeves. I’d heard it was cold but to be honest I’m sweating with these long sleeves. Don’t think I can wear this all week like. According to reports, several people have already died from the extreme cold weather, and experts have been warning people not to spend more than 10 minutes outside. It’s the perfect weather for us Geordies like.